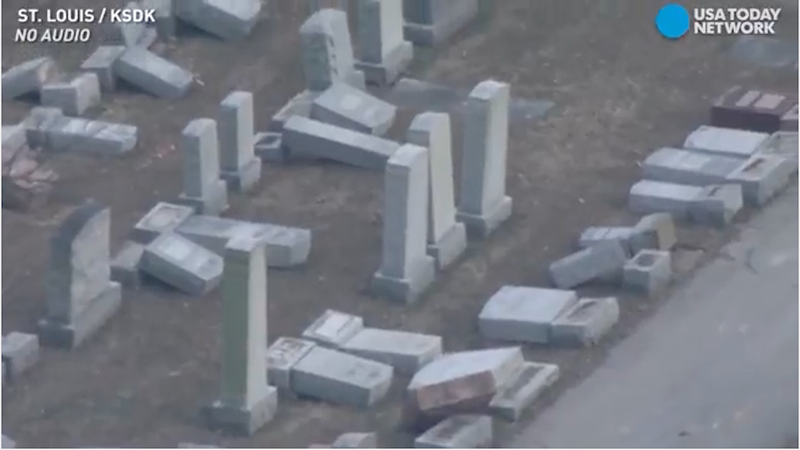 Today, in a wave of anti-Semitic violence, dozens of headstones at a Jewish cemetery were vandalized while Jewish Community Centers across the country received bomb threats. According to USA Today, the damage at Chesed Shel Emeth Cemetery shocked those who surveyed it on Monday afternoon. Karen Aroesty, regional director for the Saint Louis-area Anti-Defamation League “was appalled” at the sight when she conducted a walk-through. Police have not indicated whether they will designate this vandalism a hate crime. However, this incident coincides with bomb threats made today to 11 Jewish Community Centers. David Posner, the director of strategic performance of the JCC Association of North America, tells CNN that 54 centers in the U.S. and Canada have received a total of 69 threats since January. The FBI and law enforcement are purportedly investigating. Today, however, the White House attempted to change its tune with a vaguely condemnatory statement that references Trump’s apparent commitment to fighting prejudice. Trump’s daughter, Ivanka, and her husband are Orthodox Jews, and they are raising their children in the Jewish faith. But as far as we know, Ivanka has not protested Bannon’s appointment or had much to say regarding the hate crimes flaring up across the nation. She did tweet today, though! If you’d like to send a donation to the Chesed Shel Emeth Cemetery, you can find their website here.